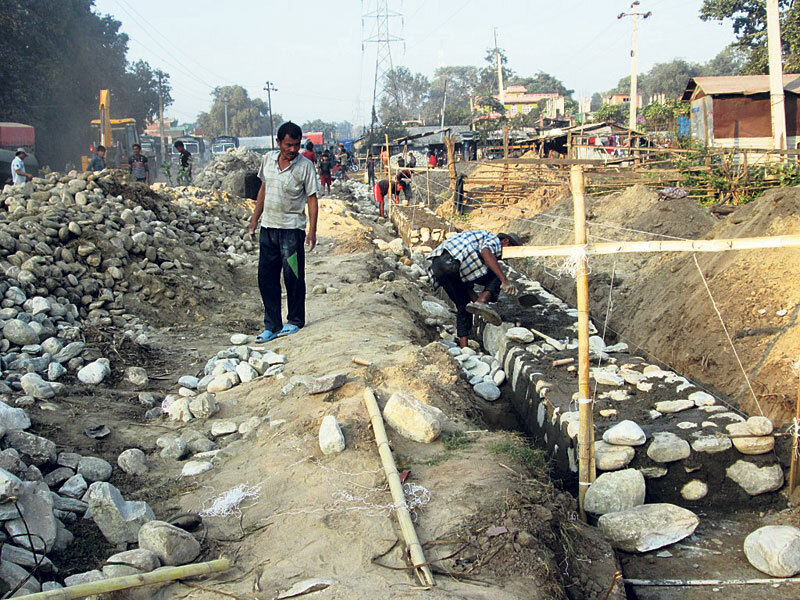 BARA, Nov 23: Work to upgrade the Birgunj-Pathalaiya Road into a six-lane road has started. The two-lane road (26 kilometers), which connects the dry port of Birgunj to Pathalaiya, is being upgraded into a strategic road. It is expected to enhance road access to the largest trading point of the country. The new six-lane road is expected to be read within 20 months, according to officials of the Trade Route Expansion Project. The project is expected to cost Rs 3.12 billion (except VAT and contingency amount). Rabindra Lal Das, chief of the project, told Republica that the project had signed agreement with different contractors in July. “They have started work now. We expect to complete the project by the end of the next fiscal year,” added Das. Work of building retaining walls and drainage has started, while earth filling work is going on in some sections, according to Das. The six-lane road will be 50 meters wide. The project had divided the road project into two sections - Pathalaiya to Parwanipur (16 km) and Parwanipur to Birgunj dry port (10 km) - while awarding contracts. The first section has been awarded to MR Contec JV, Sharma Unitech Builders and Diwa Nirman Sewa. The contract amount of this section is Rs 1.81 billion. Similarly, M R /Pappu Contec JV Birgunj, Shrestha/Biruwa/Apex JV Hetauda and Pappu/Lumbini JV Birgunj have bagged the contract for the second section worth Rs 1.31 billion. Das, however, said that bridges over Sirsiya Khola and Lalaka Khola may not be completed within the 20-month schedule. Similarly, shortage of sand and aggregate, delay in removing structures like home, shed, electricity polls, and felling trees from the right of way are the major stumbling blocks in project implementation, he added. Sources at the project office, however, doubt that the project will be completed in time as a controversial contractor -- Pappu Construction Pvt Ltd which is owned by Hari Rauniyar - together with its JV partners has bagged the contract. But Das tried to assuage such fears, stating that the project has already directed the contractors to mobilize workers.